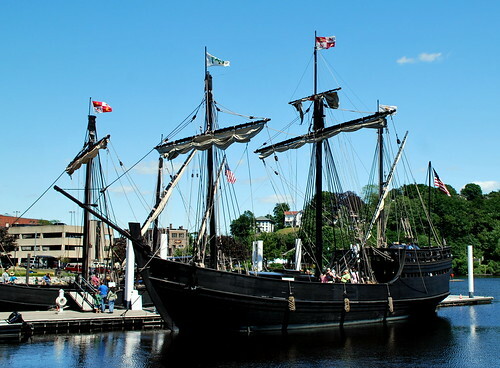 On what was unarguably the nicest Friday we've had in a long time, my dispatch partner Jeff and I took a trip down to the Norwich harbor to check out a couple of visitors to the city for the weekend - replicas of two of Columbus' ships, the Niña and the Pinta. 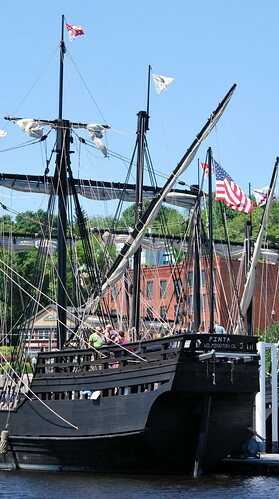 The two ships, which belong to the Columbus Foundation, travel together as enhanced "sailing museums" with the goal of educating the public and school children on the ‘caravel’, a Portuguese ship used by Columbus and many early explorers to discover new frontiers. 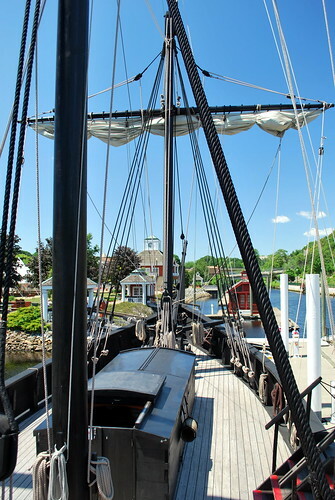 Their last port was in Washington D.C. and following their stay in Norwich for the city's Riverfest Celebration they will be continuing north to Kittery, Maine. Thinking it would be just the place to take the 'kids' (my Nikon and Jeff''s!) 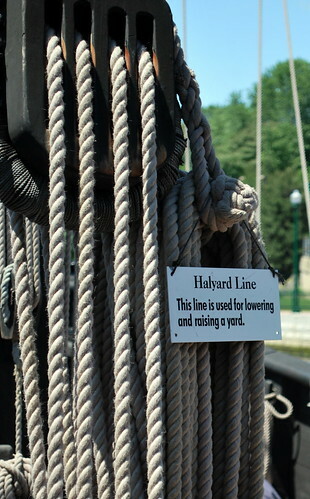 we went down to the harbor around 1:00 where we paid our $8 admission which helps defray the cost of the ships and keeping them afloat and then joined the other folks who decided it was a good day to see just how small the ships were that helped Columbus sail the ocean blue in 1492. And let me tell you - they're small! 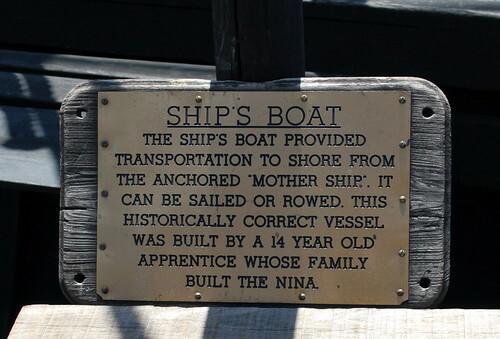 The Niña is an exact replica of the type of ship that Columbus and his men used when setting out to cross the Atlantic and explore the New World in an attempt to find a better trade route to the West Indies. 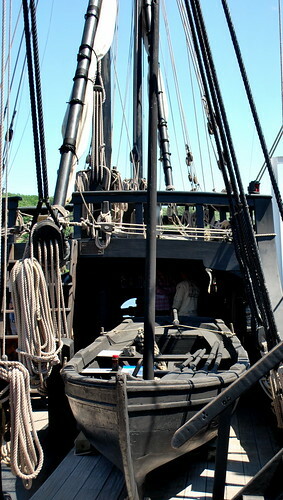 A common trading vessel in use during the Age of Discovery, Portuguese caravels were also used as cargo carriers, warships, patrol boats, and even corsairs (pirate ships). 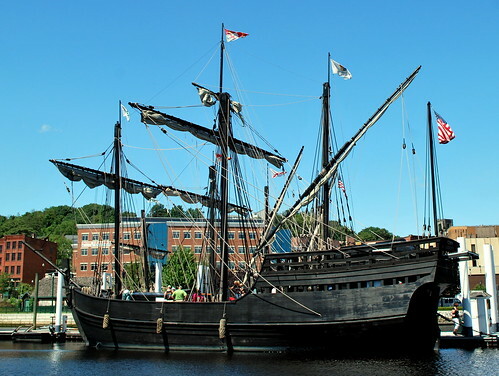 Good sailing ships that they were the caravels had the advantages of speed, a shallow draught, and excellent maneuverability however there wasn't much by way of living space for the 27 crew members aboard. 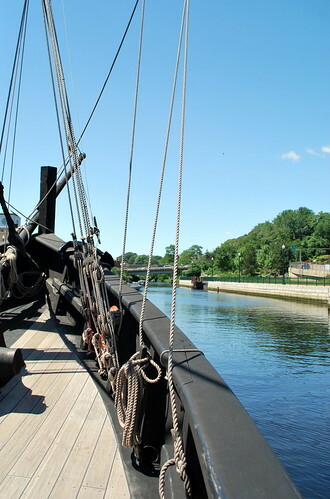 I was rather surprised to find out that back in Columbus' day all of the crew members slept on deck as the hold was reserved for cargo like provisions, armament, water, and livestock like chickens, horses, cows, and pigs that traveled in harnesses as otherwise their legs would have broken from the rolling motion of the ships. 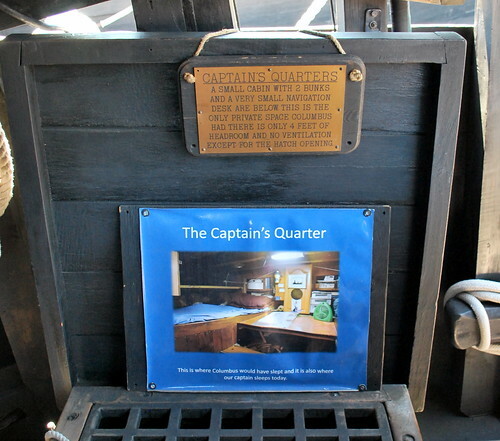 With all of that in the hold the crew would sleep on deck and unless they were lucky enough to find a spot up on the poop deck they'd generally be sleeping on a wet deck being that the holds were laden down with cargo and the ships would ride very low in the water. 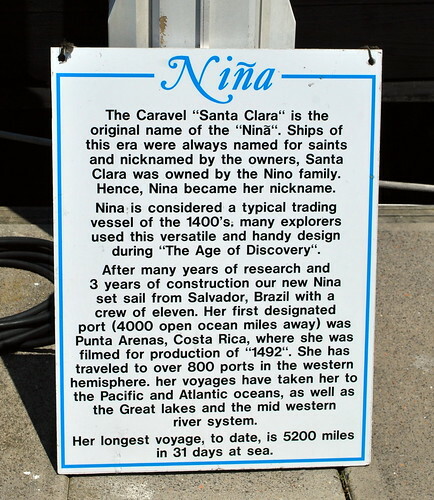 Like all ships of its type, the Niña carried a boat that was used when the crew would need to go ashore but don't get the wrong idea and think that it also doubled as a lifeboat as, according to the crew member we spoke to, it took anywhere from 3-4 hours to launch the thing using the windlass. 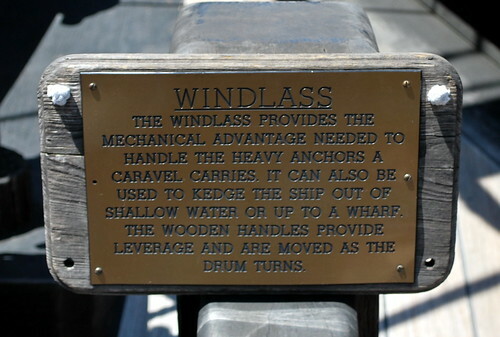 The windlass was also used to raise the anchor on board - a task that took approximately three hours according to our crew member - as it only moved a couple inches per turn. It really was a beautiful day to be on-board the ship and it would have been an even nicer day to take a sail up the Thames River but that's probably about as far as I'd want to go on one of these ships ... or maybe I wouldn't mind going a little further out and going once around the Block - Island, that is! 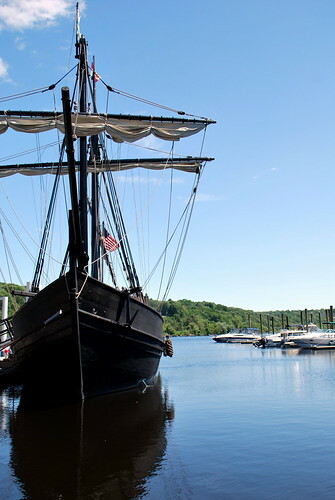 The Pinta, built larger than an original caravel, joined the Niña in 2005 as a floating museum and it's also available for charter should one wish to be desirous of taking a sail or having a party on a really neat sailing vessel. 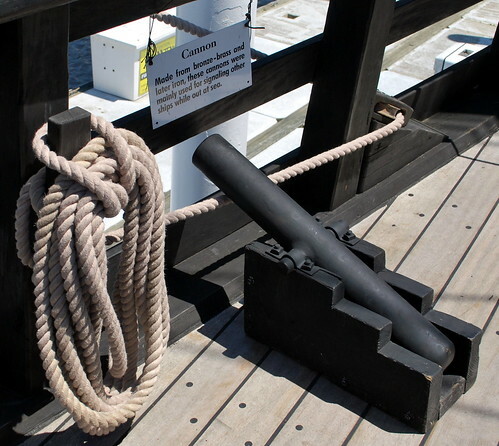 Up on the poop deck was a rather small cannon but true to what was used during that era as mostly they were used for signaling other ships. 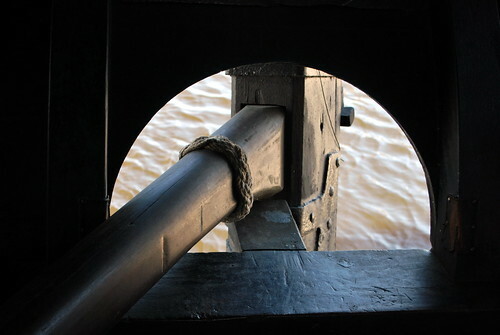 The picture below is from the top of the poop deck looking towards the bow of the ship. 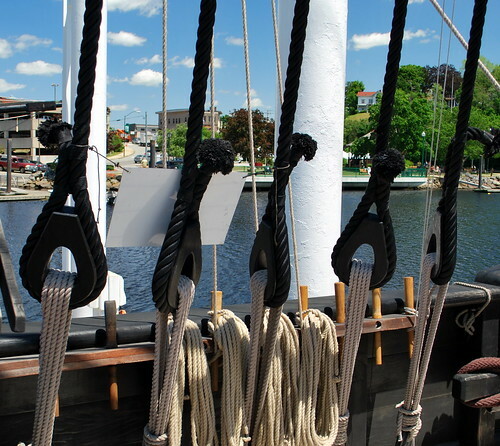 Below the poop deck was a small museum area where you could learn about the history of the original Pinta as well as buy a souvenir if you'd like. Jeff bought a t-shirt but I figured I had plenty of pictures for souvenirs! 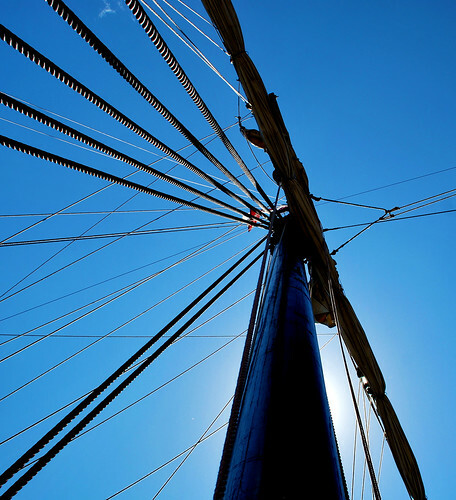 I don't know, there's just something about a ship's lines and rigging and sails - furled or not - that totally appeals to the romantic in me. Who knows, maybe I was a sailor in another life? 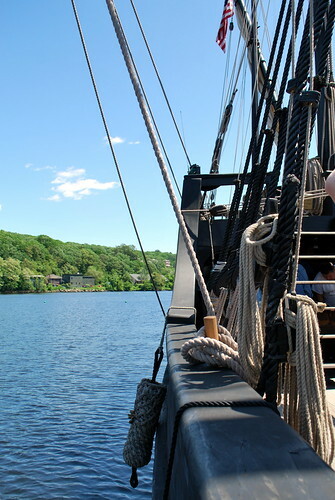 Though hopefully not on one of Columbus' ships as it really doesn't sound like the most appealing life to me though the adventure certainly had to be grand in spite of the living conditions! 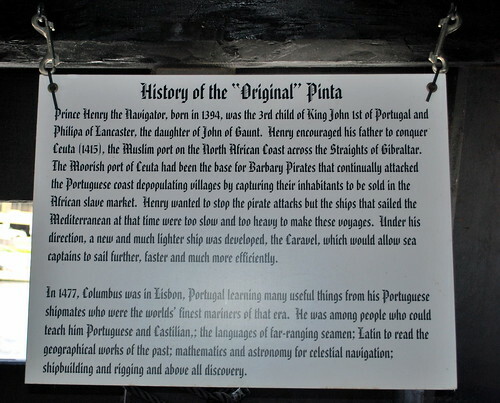 If you'd like to discover more information on the Niña and the Pinta - but not the Santa Maria as apparently she was Columbus' least favorite ship! 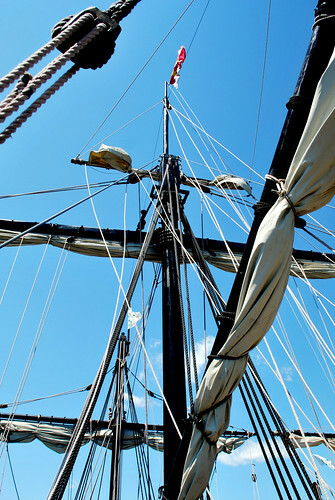 - visit the Columbus Foundation website where you can also find information on how you could become a crew member should you crave a little adventure and travel. 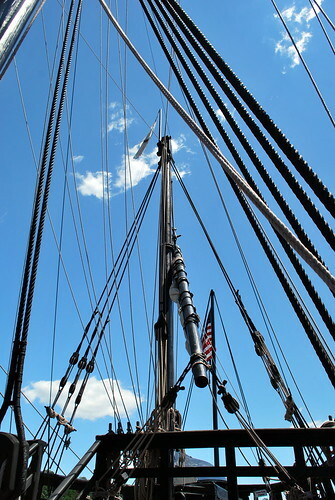 Personally, I'm just happy to take pictures of blue skies and riggings! I love anything nautical. These are no exception. Excellent history lesson as always. The sky is very pretty too. It's raining here. Still. This is day three and tomorrow it's going to rain again. 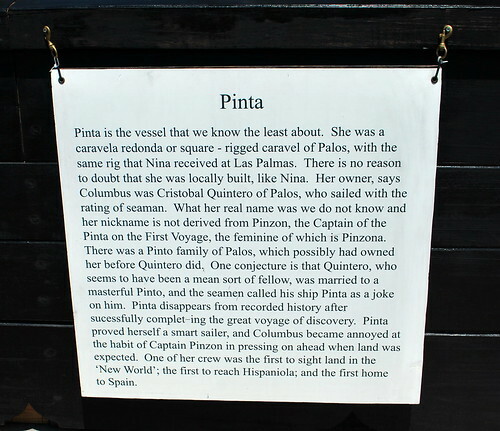 Still chuckling over Quintero being married to a masterful Pinto, thus the "Pinta" nickname. 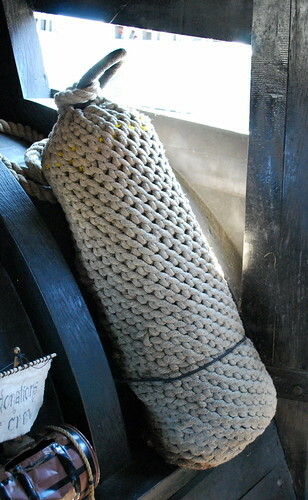 Oh, those seamen and their hilarity! 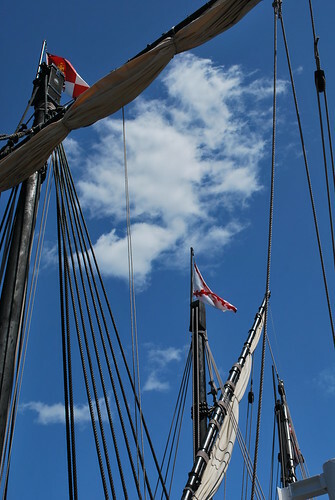 Some beautiful shots as always and a thank you for the history lesson - had no idea about the crew sleeping on deck. Interesting! Interesting for sure, but I am so glad I wasn't born in that era. I do love my modern amenities. 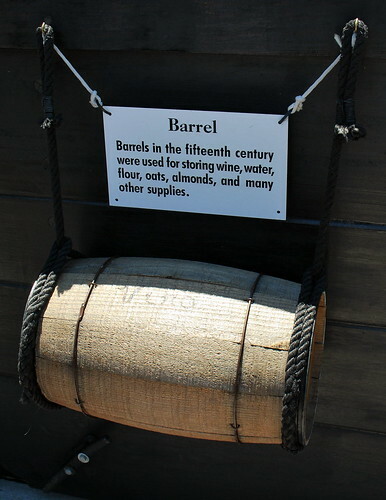 I'm so glad we have Carnival Cruise Lines! Just saying. 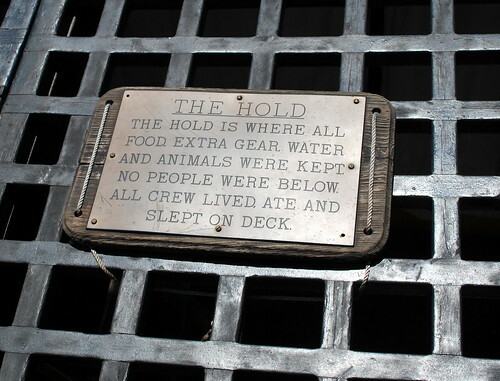 After touring the ship (I can't remember the name but I know you do) on our walkabout in Old San Juan and me tripping on the anchor post rope thingy and just about killing myself, followed quickly by going down and seeing the sleeping quarters and feeling the stifling heat... I love Carnival even more! pretty theme change! Love those ships. 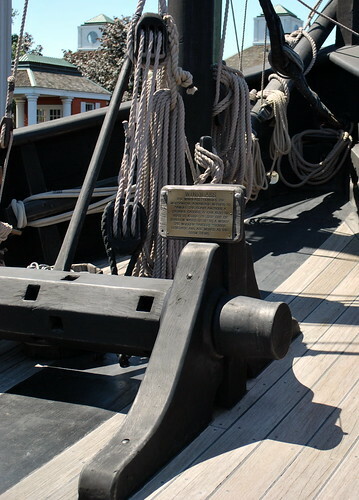 I can't believe they all slept on deck. I'll bet that was interesting. Gives me even more respect to our early explorers. 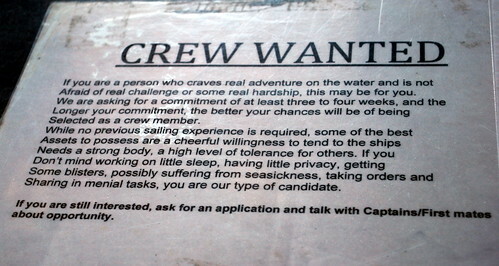 Don't you have two able-bodied young ladies who might serve as crew members? Just sayin'... LOL! P.S. 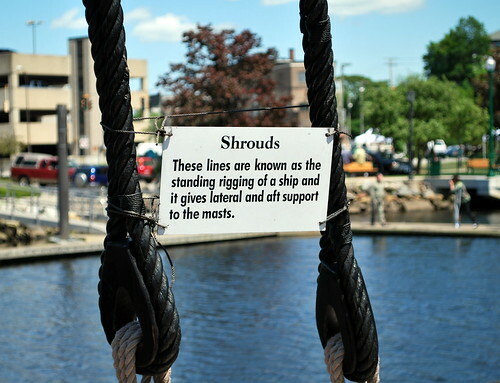 you mentioned Kittery, Maine. Miss that place. I bet we were on that same crew in another life, Linda! LOVED your shots - thanks for taking us along. 3. Love your pics and the blue sky and all the details you sought out. No way would I cross any sea in these! Great post, as usual. Gosh...I can still say gosh without sounding really corny, right? Anyway...gosh! The flowers in your new header are gorgeous!